Nativism continues to hide in plain sight in Canada. 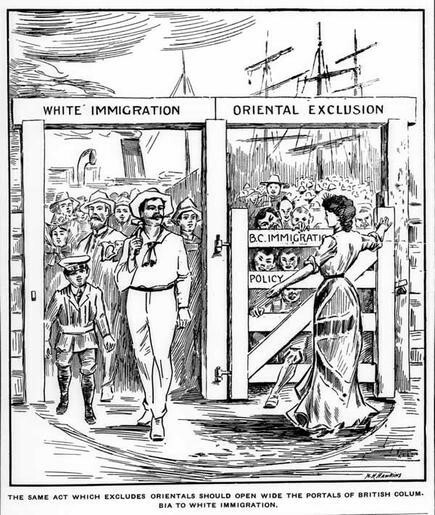 Martin Collacott’s June 2017 editorial on immigration in the Vancouver Sun resuscitates the same xenophobic ideas that animated white supremacists in British Columbia a century ago.1 While he conceals the source of his anxiety with terms like “visible minorities” and “newcomers,” his arguments represent a thinly veiled invocation of “Yellow Peril” rhetoric that was commonplace in the province during the early twentieth century. Like many contemporary critics of immigration in both North America and Europe, Collacott tries to disguise these antiquated racial ideas with euphemisms and expressions of socio-economic anxiety, but the fact remains; this is old wine in an old bottle. Previous advocates of a “White Canada” regularly deployed the same arguments in their efforts to restrict Asian and other non-white immigration. For example, Collacott’s core contention that Canada will become the first country to “voluntarily allow its population to be largely replaced by people from elsewhere” was a constant refrain of the anti-Asian exclusion movement in British Columbia (and elsewhere) during the early twentieth century. The Gatekeepers, circa 1907. Saturday Sunset (Vancouver), 24 August 1907.
preserve one of the fairest portions of the earth’s surface for the Canadian people, and not allow it to be wrested from them, not by conquest, but simply by engulfing us in the rising tide of oriental immigration. As Collacott’s editorial suggests, this fear of racial replacement is not simply a historical curiosity. Contemporary white supremacists are especially enamored of this notion of white “erasure”—or “white genocide.” Derived in part from the writings of convicted murderer David Lane, it has become one of the central messages of the so-called alt-right, which traffics in simplistic meme-driven distortions of history, ethnicity, and identity. Advocates of this concept variously denounce an international Jewish conspiracy or some blend of liberal social policies (abortion, LGBTQ rights, immigration, and miscegenation) as responsible for their plight. Whatever the source, multiculturalism and anti-racism are viewed by right wing militants as code words for a deliberate policy of white elimination. Collacott also adopts the disingenuous tactics of the alt-right when he questions the commitment of Vancouver’s immigrants to Canadian moral and ethical standards. These unidentified individuals “will bring with them values and traditions that may differ in key respects from those of most Canadians,” he contends. Collacott highlights liberal notions of “gender equality and concern for protection of the environment” as principles that his anonymous immigrants would find unworthy of safeguard. This ostensible concern for the sanctity of liberal values is a tactic often used by alt-right activists to dissimulate their actual intent. Take for example the recent spate of “Anti-Sharia Law” protests across the United States, which featured a variety of anti-Islamic protestors voicing their concern for women’s rights, or Richard Spencer’s embrace of diversity to justify white nationalism and racial segregation. In reality, Collacott nostalgically yearns for an imagined homogenous past that only ever existed in the minds of the province’s most obstinate white supremacists. His admonition regarding white population replacement emulates precisely the words of British Columbia’s one-time Minister of Finance and Agriculture, Francis Carter-Cotton. In the midst of a concerted provincial campaign to force the federal and imperial governments’ hand on Asian exclusion in 1899, Carter-Cotton defended the idea that British Columbia “should be occupied by a large and thoroughly British population rather than by one in which the number of aliens largely predominated and many of the distinctive features of a settled British community were lacking.” Only by commanding and consuming the rich resources of the Pacific coast could white civilization prosper in British Columbia, Carter-Cotton avowed. In reality, Collacott’s commentary plainly reiterates the arguments espoused by previous champions of white supremacy. They too essentialized Asian immigrants as hyper-competitive and economically rapacious interlopers, or as culturally alien intruders. Those ideas rested then—as now—on fundamentally racist notions of immutable racial characteristics that preclude assimilation and spell only disaster for Canada. Whether couched in a century-old language of civilizational decline, racial degeneration, and economic competition, or camouflaged in the alt-right’s semantic contortions of white nationalism, “race realism,” and identitarianism, these are profoundly dangerous ideas that undermine the very foundation of modern Canadian society. 1. Martin Collacott, “Opinion: Canada replacing its population a case of wilful ignorance, greed, excess political correctness,” Vancouver Sun, June 5, 2017. Confronting Canadian Migration History by David Atkinson is licensed under a Creative Commons Attribution-ShareAlike 4.0 International License, except where otherwise noted.